The Mariette wedding tiara with crystals adds an air of intrigue to a bridal look with its textured and antique-inspired details. 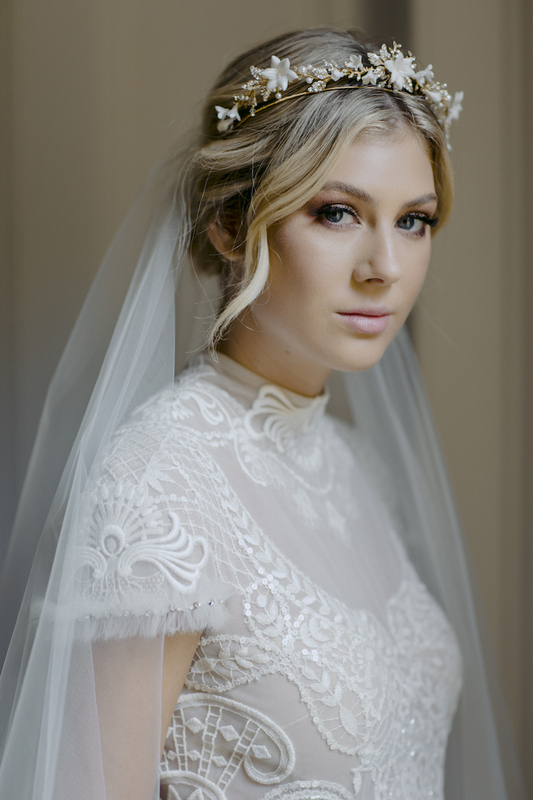 Designed for the modern bride seeking an enchanting and refined headpiece to complete her bridal look, this statement piece suits both traditional and untraditional wedding gowns with its bold, feminine aesthetic. The epitome of understated opulence, it harmoniously brings together gold, silver and ivory tones into one precious piece that will become a beloved family heirloom. The Mariette wedding tiara is made to order. Please allow 4-6 weeks for production plus delivery times. The Mariette wedding tiara with crystals was designed for wedding gowns of refined sophistication. Think ladylike cap sleeves, classic silhouettes, modern and sheer floaty gowns and dresses with a subtle boho vibe. Style it with loose and romantic updos, half up hairstyles and loose relaxed waves. We love how the Mariette looks in voluminous hairstyles with middle or slightly side parts. The fine metal headband sits neatly against the head and the softly scalloped silhouette sits above the hair in an effortlessly elegant and beautiful way. 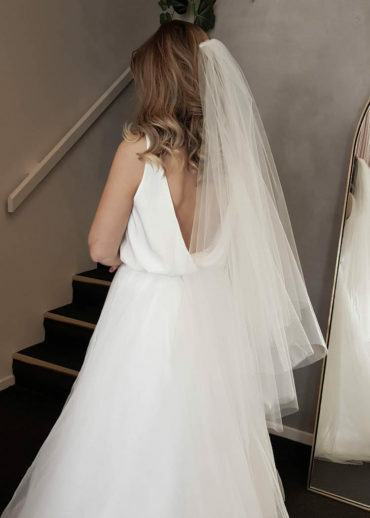 Pair the Mariette with a wedding veil, with the veil either secured at the top of the head towards the back or above a low set bridal upstyle. Mariette can be styled with a full gathered veil or a simpler drop veil in fingertip, chapel or cathedral length. Browse our full veil collection or contact us and we’d be happy to offer a recommendation based on your wedding dress and hairstyle.